savory snacks are healthier than ever. But whats next? Manufacturers and ingredient companies are working together to help build the next generation of savory snacks. In spite of health recommendations telling us to avoid eating between meals, snacks are a growing multibillion-dollar industry covering a wide variety of items -- from bars to chips, from carbohydrate-based to protein-based. Perhaps the real challenge is, for many consumers, the term “healthy snack” is an oxymoron. But today’s food processors are working to change that. Many of the same people looking for healthier snacks for themselves and their children also care enough to look for signs their favorite product is doing something good -- for its employees, the economy and the Earth. “Green is a trend that’s here to stay,” says Late July’s Nicole Dawes. “The focus on the overall ‘green’ footprint of the company is not just what’s in the package but the package itself.” So pay attention to packaging, especially if that’s contracted out to another company. When it comes to healthful indulgence, ingredient companies are becoming more interactive with manufacturers when it comes to reconciling what consumers say they want and what they will truly eat. “It used to be consumers wanted a snack that was good for them, and then they hoped the flavor profile was pleasing; nowadays, consumers expect a good-for-you product that also is a delicious treat to keep them going,” says Mia Arcieri, market manager for FONA International Inc., Geneva, Ill.
Baking, oven-toasting and air-drying are replacing deep-fat frying for many snacks. While the technical challenges of changing the cooking method differ with the product, crackers are a natural for baking. “The challenge has been to achieve a full serving of vegetables into a snack product with a small serving size,” says Sean Craig, senior executive chef for Gilroy Foods & Flavors, Omaha, Neb. “Creating palatable snack products with a full vegetable serving can be done with the help of ingredient systems such as Controlled Moisture vegetables or GardenFrost purees,” which eliminate excess water in vegetables by up to half and also have significantly less salt than vegetable bases. “They do not contain flavor-muddling acids or preservatives-and it shows with a clean label,” he adds. Making healthier savory snacks is leading to paradigm shifts in some categories. The merging of the cracker, chip and pretzel segments is an example pointed to by Suzanne Mutz-Darwell, marketing manager for National Starch Food Innovation, Bridgewater, N.J.
FONA International’s Mia Arcieri points to some future flavor trends on the savory snack horizon, such as habanero, three-cheese blends, beer flavors, rosemary, sweet & savory combos (berry chips), Philly cheesesteak chips and lime and black pepper chips to name a few recent product introductions. Whole grains have become a big part of the trend toward healthier snacks. The Whole Grains Council, a part of Boston-based Oldways Preservation Trust, has seen double-digit growth in companies using the Whole Grain stamp on their products. Late July’s Dawes admits there are technical challenges in building healthier savory snacks. “Finding ingredients in the form we need them is one,” she says. “We require all our vendors to meet a series of requirements. Not just kosher and organic but sometimes vegan and lactovegetarian, plus sustainability, Fair Trade, and [submission to] third-party audits. Gutierrez says other ingredients that pose problems for flavor and texture include herbs such as ginseng, green tea, guarana, kola nut and yerba maté; proteins, such as whey; branched-chain amino acids, such as L-valine, L-leucine, L-isoleucine; and bulk fiber, such as psyllium and oats. Acrylamide is still an issue in many fried snacks, but it’s being overcome. “Acrylamide is formed upon heating of foods by reaction of the inherently present amino acid asparagine and carbohydrates,” explains Hugo Streekstra, senior scientist for enzyme application at DSM Food Specialties Inc., Parsippany, N.J. Acrylamide is a suspected carcinogen, and most food manufacturers are trying to reduce acrylamide levels in their products. According to Streekstra, formation of acrylamide is prevented by conversion of asparagine into another amino acid that is commonly present in food, aspartic acid. As a result, asparagine is no longer available for the chemical reaction that forms acrylamide. DSM’s PreventASe mitigates the formation of acrylamide in foods, including savory snacks, by up to 90 percent and is approved for use in the U.S. and other countries. After several years of research, flavor scientists at Edlong Dairy Flavors, Elk Grove Village, Ill., in 2008 developed flavor technology that eliminated the need for added diacetyl in dairy flavors and end-products.The Ed-Vantage line maintains the mouthfeel, aroma and buttery flavor that are characteristic of diacetyl-containing products without added diacetyl. For those with food or allergy sensitivities, healthy snacks are those without glutens and other allergens. “The [challenge] from the gluten-free market is to produce products that can replace gluten functionality,” says Gum Technology's Prenzno. Gums like xanthan and guar are suitable ingredients for this function. Coyote Brand Stabilizer ST-101 — a “synergistic blend” of xanthan gum and guar gum — is one example. It binds moisture (reducing staling), improves cell structure, increases dough pliability and improves freeze/thaw stability in savory, gluten-free products. The gluten-free trend is showing strong and steady growth, but early products suffered from the “healthy can’t be flavorful” presumption. That’s being overcome by folks like Mary Waldner, founder and leader of product development and brand strategy for Mary’s Gone Crackers, Gridley, Calif.
Waldner started the company following her personal struggle with Celiac Disease “after finding a shortage of nutritious, gluten-free options that tasted good.” Yet her crunchy, paper-thin crackers became a hit beyond Celiac sufferers — so much so, Mary’s Gone Crackers Original was awarded a gold medal for “the most outstanding cracker” last year at the National Assn. for the Specialty Food Trade product awards. Today, companies such as Mary’s Gone Crackers, Late July Organic, Dr. Kracker and others have proven it’s possible to build a successful company on a healthy savory snack line by keeping flavor first yet staying innovative in execution. 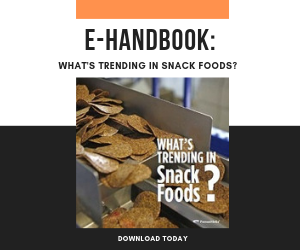 Sweet and savory snacks are forecast for constant growth and food processors are taking note.